We've created a Java-applet so you can have a look how our Floating Cameleon loudspeaker looks in your home. This applet takes a few minutes to load, but we can assure you it's worth the wait. 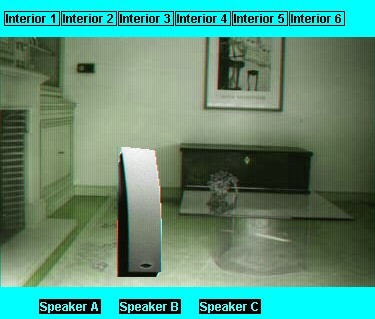 Click and drag the the speakers to move them. We've created one more applet that gives you the oppurtunity to see the 6 different colours you can choose from. Click here to go there.